should definitely consult a doctor or a nutritionist. I present you, weight lost tips from yours truly. are the only reason your going to lose weight it’ll come back to bite you later. within their price range. The money issue can be alleviated by cooking at home. amount of water necessary for that to happen. from Coolidge Corner to Harvard Square (a three mile walk) and then played an hour of Dance Central right when I got home, I was hurting all over but it was totally worth it). you feel bloated an full which means the elimination of cravings. 7. Eating while watching TV is also a big no no. I’ll admit I’m still guilty of this 35 pounds later but if you plan on cutting calories then eating a bag of chips while watching the football game or a movie is also a no no. When you’re heavily preoccupied with something as focus intensive as watching something, eating becomes so instantaneous and sub conscious that you lose track of how much you eat. Even to this day I can consume an entire bag of tortilla chips during a football game without realizing it (around 2000 calories in one sitting which is pretty much the equivalent of a daily intake). Luckily I can counter act this through working out and a boosted metabolism from drinking mostly water but for those just starting off or ever, this isn’t recommended. You should always keep track of how much you eat in one sitting and avoid having an open bag/box in front of you while watching TV or a movie. 8. Portioning is key and this means looking at a nutrition label but there are some tricks that you need to learn while getting your information. This is a sample label for a package of nine oatmeal cookies. Upon the initial scan, the common misconception is that the entire package is only 110 calories but be warned, you’re getting more than what you bargained for. 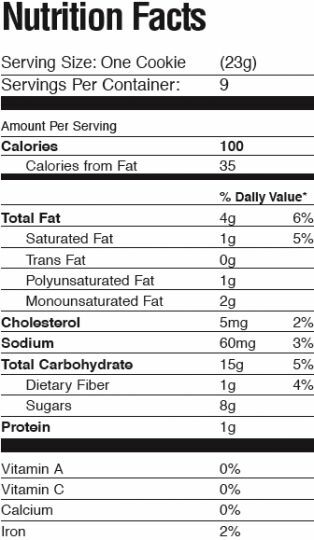 The three listings you need to check for as marked in red at the very top are “Serving Size”, “Servings Per Container”, and “Amount per serving. 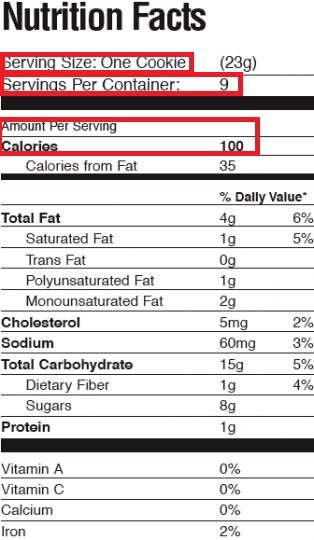 The amount per serving is 100 calories but on the top the “Serving Size” is ONE COOKIE with there being a total of nine servings or NINE COOKIES so in reality you’re consuming 900 CALORIES instead of the perceived 100. It gets worse though, that bottle of coke you just bought from the store…. The label on the left is what people think they’re consuming without reading the rest of the label while the one on the right as proposed by the FDA shows what’s actually in that bottle. We’ll never know why these labels are so cryptic and misleading but is important to read them carefully as we tend to consume more than we’d like to without realizing it. 9. It should be noted that not all calories are good calories. 500 calories from a well balanced meal consisting of well portioned lean meats, cooked vegetables, and other carbs can go further than that Big Mac from McDonald’s or that bag of chips. The Big Mac and Chips are what we call “empty calories”, calories that offer no nutritional value what so ever and will make you feel crappy later. It is important to watch what you eat and make sure that what ever you’re putting in your stomach offers enough nutritional value to keep you going through the day. 10. Speaking of portioning, you want to make sure that your three meals of the day don’t exceed 500/600 calories. Eating Breakfast at home and making your own lunch and dinner instead of eating out can go a long way when it comes to shaving off calories. A lot of restaurants still don’t list their calories on their food which makes it impossible to control what you put in your stomach. If a restaurant chain such as Cheesecake Factory offers a “low calorie” menu then definitely consider those options as they never exceed 500 calories. Most of the regular meals can be as large as 1000+ calories due to the ridiculous portions for the sake of getting people more bang for their buck and that doesn’t even include the free refills on fountain drinks or the occasional bottomless sides at some chains and lets not forget dessert, you could end up putting down over 3000 calories on one meal without realizing it. Restaurants should only be a once in a while thing and even in those occasions, good judgement is key. Cooking and prepping your own meals will not only shave off calories but will save you money in the long run. 11. Last but most importantly, the number you see on the scale is never a judge of character. It’ll never tell you how awesome or beautiful you are. Losing weight isn’t a cake walk and you will face many hardships in the process. It is important that you be good to yourself and not to be hard on yourself when you don’t meet certain milestones at the pace you hope to. We’re all different and therefore lose weight differently. For some of us, the weight will fall off and for others it’ll be really stubborn. Even if you look on the scale and realize you only lost one pound in the previous week, be happy with that one pound because it means that you’re doing something right. This isn’t The Biggest Loser and you shouldn’t expect your self to shed 9-12 pounds a week. This isn’t a race and you should take your time and enjoy the journey. to ask by sending an email using the contact form in the “Contact” section. Happy New Year everyone and I hope this year brings happiness to all. Stay classy. This entry was posted in The Epic Autistic's Guide to Life and tagged calories, dieting, Fast Food, health, McDonald's, misconceptions, nutrition, nutrition facts, self esteem, self worth, The Biggest Loser, weight loss by flem0328. Bookmark the permalink.